LCD TV screen protector designed to fit a 23 to 24 inch LCD monitor or TV, Actual Dimensions: 21.9" W. x 14.7" H. 3/16" Thick. Television screen guard comes standard with shock absorbing felt pads and velco straps. Clear rubber bumpers available on request for medical use. 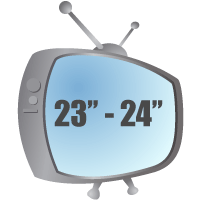 Protects TVs or Monitors from: 23" to 24"
Please check the size of our television screen guard against your monitor/TV size to insure it will fit to your satisfaction. If it does not and if the size is close to what you need please give us the size you would like us to make in the comments section with either the measurements or the Make & Model number of the display at checkout. We can cut the TV screen protector custom on our laser cutter and usually without any delay in shipping. Custom TV screen protectors are not returnable for size issues however. We use these in our weldshop to cover the our computer screens and they work great. I bought this screen protector for my children's LCD monitor, so that instead of replacing a monitor in a few months, i just clean the screen protector. Well, the protector costs almost a third of the monitor itself, but in a long run i figured it will worth it. Definitely too expensive, but quality is very good. I would have given it 5 stars it the price was lower.